What is a Unit Fraction ? What is a unit fraction ? Definition and examples. A unit fraction is a fraction with a numerator of 1. 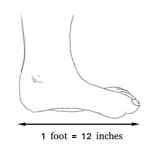 For example the fractions in the image below are unit fractions. A unit fraction can be expressed as the sum of two equal unit fractions. A unit fraction can also be expressed as the sum of two different unit fractions. 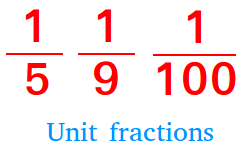 Any fractions can be written as the sum of unit fractions in multiple ways.